Since there is no AIO magic script currently out there I decided to release one. I already had a lot of the individual spells already coded in my own private collection but thought it's time to release. I am currently getting the requirements for lunars so once I have them, I'll write the code for those too. Bolt Enchanting - Will enchant any and all bolt types, no need to configure just start with the required runes and un-enchanted bolts in your inventory. Also added tick enchanting for 3-4x xp per hour. Jewellery Enchanting - All jewellery enchants (if I missed one just let me know and I'll add it) just select the enchanted version of your item from the list. Super Heating - All ores including rune. Teleporting - Remembers the click location again to simulate afk/mouse keys but will reset at random intervals or when the mouse is moved. Anti Ban - Unique antiban methods randomly activated including a complete randomised sequence of events. Currently working on a customisable option for you to add a player fatigue option so when you've been playing a while, the bot will slow down then speed back up after it sleeps for a while etc. The majority of reported bans come from people using stun/alch or running the script in an open area, I got 55-99 magic with a mixture of alching, jewellery enchanting to 70 and then 70-99 bolt enchanting mixing between tick and regular speed. This was all done in crowded areas like the grand exchange. As always guys let me know any problems! You can do this by deselecting side-panels in the advanced options menu. FYI all online and ready to go. Any fail-safe if the bot stops gaining exp for a while? Any more info on this? Like what does it do wrong? I dont have the smithing level to test it so just guessed. I mean it won’t be hard to add just didn’t see a need really. 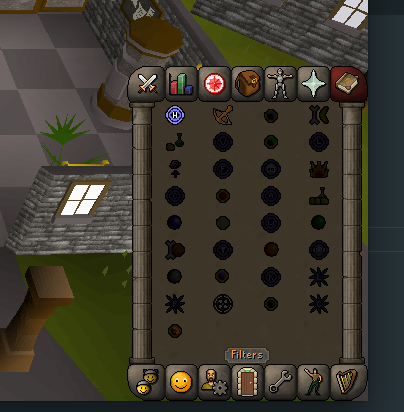 While high alching it started click the item only (thus highlighting it, and unhighlighting it repeatedly). I shut it off. Is this an intended antiban feature? It did work correctly for about 1 hour before this. And never went back to the magic tab? 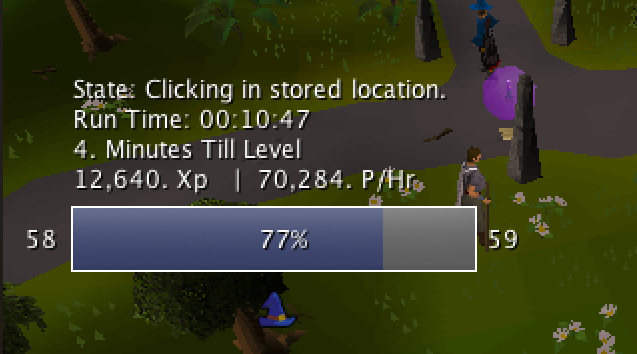 As part of the game now you can just spam the mouse and it won’t stop the alching process whereas years ago if you tried to click to fast it would break your alching cycle. When you say it just was clicking the item, were you still in the process of alching? It's possible it was in the process of alching. It's normal pattern was not to overclick so I thought it was busted when it changed patterns. I'll run it some more and watch it more closely. Okay 4 minutes in and it replicated the (believed) problem I initially mentioned, but I now feel it is certainly antiban or randomization. 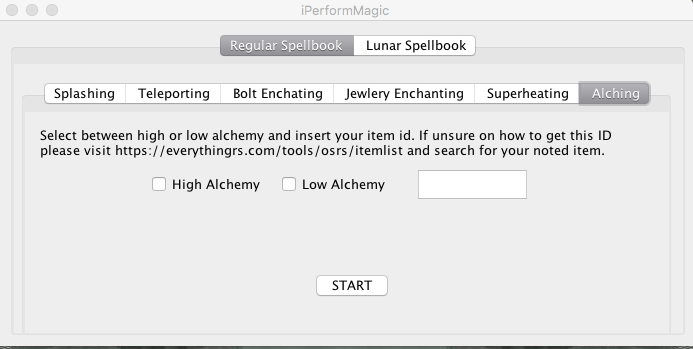 To be clear it does click the item continuously (without alching or entering the magic tab) but eventually after that it reselects the magic tab and continues alching. Sorry for panicking! Oh and one other note the GUI interface has a visual bug in the alching section. There seems to be 2 intended lines of text but it displays like there is addition text overlapping it. Highlighting the text makes it readable. Does not affect functionality at all. Could you grab a screenshot for me? I didn’t see anything like at when I made it :c if you can screenshot that’d be great! ill take a look, not sure what the issue is as it’s just normal for me but I’ll see if I can find any But, thanks for getting back to me! Which is exactly how the code is, have you tried restarting your client? If it helps I have noticed that resizing the window at all completely corrects the visual issue. I mean resizing it larger, smaller, or even back to the same size. I am using Windows 10. Might just be me, but overall it is not very important since it affects nothing lol. Ty for the great script.